The motorcycle on-road test, or module 2 must be taken at designated Driver and Vehicle Standards Agency (DVSA) test centres located throughout the UK. The test has many elements, most of these will involve the riding examiner assessing your riding skills covering many diverse roads and systems. 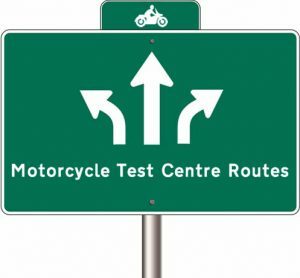 The test centres that provide module 2 tests see examiner develop motorcycle test routes. As the examiners know the area, they are best situated in developing challenging test routes that will see riding candidates abilities pushed to the limit. Motorcycle test routes involve as many diverse road types and as many varied traffic systems as possible that the location can offer. Certain areas may be easier than others. For example a module 2 test taken in a rural area will involve less traffic and traffic systems that are less complicated than a very busy city. The motorcycle test routes will of course be challenging wherever taken, and the routes provided should be used as a guide and reference into what to expect. Module 2 test routes do change for time-to-time and are also subject to change at the riding examiners discretion. An example of this change could be due to traffic queues at peak times, where the examiner will take an alternative route. The motorcycle test routes section also contains any available extended routes. Extended motorcycle test routes are used for individuals who have committed a traffic offence serious enough to receive a letter of intended prosecution. This will result in a court summon where the offender will have their motorcycle licence revoked. After the riding ban, a court has imposed a ruling that the rider must once again pass the motorcycle test before they are entitled to ride again. This test will be in the form of an extended test. Extended tests last longer than the typical module 2 test, and as a result the routes are also longer.